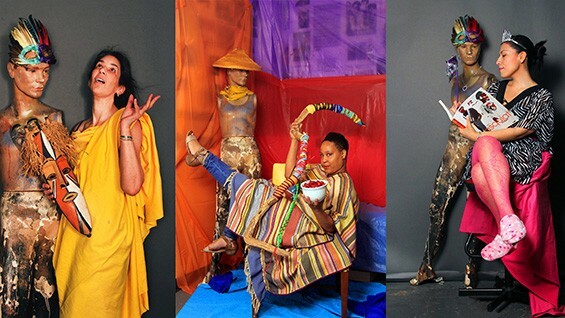 To celebrate its 46th year, the Saturday Program will be hosting a costume/wearable art party in the Peter Cooper Suite on the 8th floor of The Cooper Union's Foundation Building. If you haven't been, the Peter Cooper Suite boasts a killer view. Music will be playing, food and drinks will be flowing, and the multi-generational family that is the Saturday Program will be reconnecting. So, if you make wearable art or know others who do, this is your chance to flaunt your feathers. Whether you have a penchant for performance, a flare for the fabulous, a studio full of sculptural costumes, head dresses, mysterious masks or sonic ensembles, all characters are welcome. Get your photo taken. Snag a SatPro t-shirt. Win some prizes. Network with your extended family. And, of course, show your love and help us celebrate the Saturday Program. Support Sat Pro with any amount you would like to donate at the door; SUGGESTED donation are $20, Sat Pro Alumni $10, & Students $5. If you can't join us, you can still support us and send your donations on-line. All donations are fully tax deductible.